What is a good moveset for Dhelmise? If you have a good moveset for Dhelmise, post an answer below and upvote the best ones. Remember, this is for competitive movesets, not in-game. Ability, EVs etc should be included, and we encourage sets for VGC doubles as well as singles. Make sure to read all the guidelines here. Dhelmise Pokedex & learnset for reference. Dhelmise works great as a Spinblocker and Rapid Spinner. The EV spread, together with Assault Vest, allows Dhelmise to survive many hits before it can even Attack. 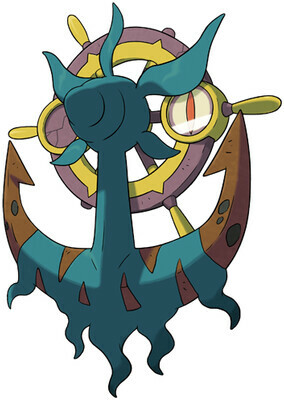 Anchor Shot works great with Dhelmise's ability Steelworker, also traps Special Walls like Blissey. Power Whip may have a Low accuracy, but it is necessary to keep the damage output high while not running Choice Band or Life Orb. Earthquake gets more coverage and deals with some opponents like Heatran. Phantom Force is STAB. Rapid Spin is useful for removing Hazards set up by Skarmony and Ferrothorn, while Gyro Ball takes Advantage of Dhelmise's very Low Speed and Brave Nature. Besides being a Rapid Spinner and a Spinblocker, Dhelmise can also be a great physical Attacker. Making it a great suit for many teams. - Gyro ball - With Dhelmise's low speed, an iron ball and a nature hindering it's speed, gyro ball can do some serious damage, steelworker also comes in handy too, boosting the power of the attack. - Shadow claw/Power whip - Both of these moves have STAB, you can either use Shadow claw for greater coverage, or you can use Power Whip for more powerful hits. - Swords Dance/Protect - You can either up that already good attack that to make it better, or protect yourself from damage. Explanation: Dhelmise is a great Physical Attacker but how about a Special Attacker Dhelmise? Let's put that 86 Base Special Attack to good use. Choise Specs is to give Dhelmise a boost in its Special Attack. Surf is Fire type Coverage. Giga Drain is STAB and used for Healing. Shadow Ball is STAB and it has a Chance to lower the Foe's Special Defense by 1 stage. Flash Cannon is Ice and Fairy Type coverage, has a Chance to lower the Foe's Special Defense by 1 stage and it's powered up with Steelworker. If steelworker is skill-swapped onto a steel type, will it power steel type moves up even more?